Here is a video about prickly poppy, Argemone polyanthemos. Prickly poppy is a conspicuous plant of the western Great Plains. It is annual that comes up from seeds each spring and therefore is more abundant and visible in wet years than drought years. This summer, I made four videos about local plants, trying to choose plants that you can see from the Interstate. It’s an interesting comment on our landscape that most of the ones you can see from the car across the high plains are weeds, crops or ornamentals, not natives. 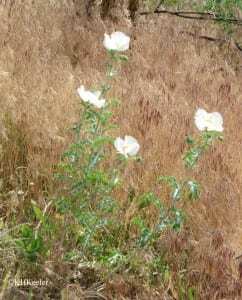 Prickly poppy, however, is a native, with big handsome flowers.